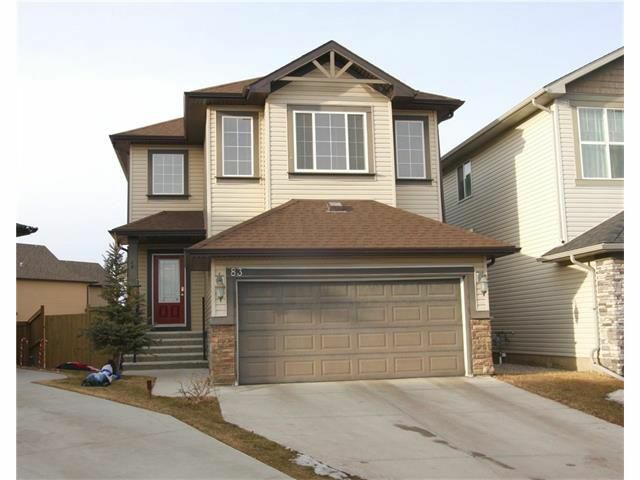 Gorgeous fully developed 4-bedroom home has much to offer in a quite cul de sac location! 9 ft ceilings, new hardwood and tile flooring are found throughout the main level. Open concept kitchen comes complete with stainless steel appliance, centered island, eating bar, & corner pantry. The living room is complemented by a tile surround fireplace while the dining room is surrounded by windows and gives you access to the spacious balcony that easily accommodates a gazebo, patio set, & bbq. A split staircase separates the south facing bonus room from the 3 bedrooms & 2 bathrooms. Master en suite features granite counter tops w/glass vessel sink, large soaker tub, separate glass surround shower and entrance to the walk-in closet with custom shelving. Fully finished walk out basement offers a 4th bedroom with walk in closet, 4 pc bath, & large family room. The pie shaped back yard is great for entertaining & features a patio area. Conveniently located close to 3 schools, Fish Creek Park, & amenities.